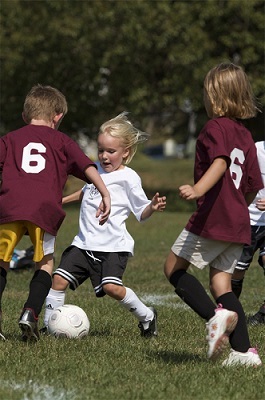 The intramural program is soccer for children ages 5-8. At this level of play, teams practice 1 time per week, and games are held at Logan Park on Sunday afternoons. Teams participate in a tournament at the end of the spring season. The goal of this program is to introduce soccer skills and team play in a supportive and non-competitive setting. The emphasis is on having fun and building confidence in the game of soccer. size field in a 4v4 format. In both levels of play, score is not kept or recorded and there are no goalies.